What happens at the apex of the world affects the rest of the globe. It is true more so today than in any other era. The sheering off of Ayles Ice Island dramatically changed the outline of the map of Canada. The melting of snow and ice increases the absorption of sunlight and causes the reduction of the permafrost, which in turn impacts local inhabitants and industries. Kerani, one of Europe's more popular keyboardist and piano players has used her music to spotlight the history of the Arctic and the changing condition in the north and her album is called Arctic Sunrise. The title tune, Arctic Sunrise, adds light to the stark landscape. The tundra has little life on it. Billowing winds scour the land, carving it into macabre statues of century's old ice. Sadly, the sunrise adds no heat. The only comfort is the length of the day. The Arctic is a region of extremes, all day light in the summer, all day night in the winter. Far Away From Home is the longest cut on the album and the best. It is a serious and sad piece for a somber time. It was not bad enough that the journey was treacherous at every turn, but every mile traveled took you further and further away from the people and the land you love. You long for mother's touch and grandmother's smile. You remember brother's humor and father's blessing. Your only comfort is the promise of destiny. All is lost. As a child in northern Massachusetts, I remember watching ice growing on a pane of glass. It was the wee hours of the morning when the wind blows and stars sparkle like jewels. It was very cold. The crystals grew from the bottom of the pane in lattices of frost like crystal ferns. Decades later, I have discovered that there is music for just such an occasion. Kerani captures that miracle in her song Ice Kingdom. She recounts a land where the moon gives everything a blue, eerie glow and the wind hushes the night. Like the music, there is a great amount of beauty to behold. The Arctic region is plagued by icebergs and floating masses that are a danger to shipping and an indicator of global warming. They are also a source of blue and white beauty made out of water in its purist form. Drifting Ice is a placid song that follows the ice floes as they bob in the ocean and dissolve in the sunlight. They were part of the frozen earth for thousands of years only to sadly vanish in a sea of salt. There is a lively intro to the song Discovery. The tune suggests adventure and travel. Imagine leaving the ice station, getting in a Sno-Cat and heading for the horizon. The Arctic is a land of unfound riches. Oil, yes. Gold, yes. Maybe even uranium. But then there are the legends, stories about giant men and giant dogs. The Inuit talk about the Mahaha, an evil creature. Or the The Qallupilluk, the child-stealers. Whatever we do, we must beware of the Ijiraat, for they are the shape-shifters. The mythology of the north is as varied and fantastic as the rest of the planet. The arctic borders many countries in the north. Russia, Norway, Sweden, Finland, the United States, Canada, Greenland, and Iceland all share the cold desolate landscape and the wealth of knowledge found in this unique region. The final cut, The Spirit of the Last Wilderness is a tribute to those peoples that not only live on the top of the world, but also thrive despite its impediments. 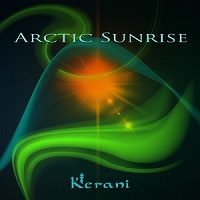 Arctic Sunrise is the first Kerani album I've heard and I like it very much. Her compositions are complex with a lot of thought to descriptive passages almost like story music. Her piano and keyboard skills are irreproachable. Joining her on the album are a five talented musician, Jan Mertens on flute., Romain Van Beek on guitar, Joep Willems on cello, Wilfred Sassen on violin, and Lars Wachelder on horns. I highly recommend this album.